Between 478 BC and 476 BC, a number of Greek maritime cities around the Aegean Sea did not wish to submit to Persian control again and offered their allegiance to Athens through Aristides at Delos. 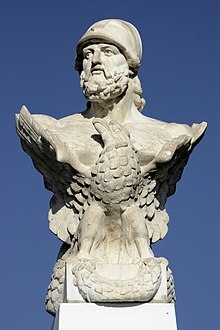 There, they formed the Delian League (also known as the Confederacy of Delos), and it was agreed that Cimon would be their principal commander. As strategos, Cimon commanded most of the League's operations until 463 BC. During this period, he and Aristides drove the Spartans under Pausanias out of Byzantium. Cimon takes command of the Greek Fleet. Pieces of broken pottery (Ostracon) as voting tokens for ostracism. The persons nominated are Pericles, Cimon and Aristides, each with his patronymic (top to bottom). Power was transferred to the citizens, i.e. the Council of Five Hundred, the Assembly, and the popular law courts. Some of Cimon's policies were reversed including his pro-Spartan policy and his attempts at peace with Persia. Many ostraka bearing his name survive; one bearing the spiteful inscription: "Cimon, son of Miltiades, and Elpinice too" (his haughty sister). Eventually, around 451 BC, Cimon returned to Athens. Although he was not allowed to return to the level of power he once enjoyed, he was able to negotiate on Athens' behalf a five-year truce with the Spartans. Later, with a Persian fleet moving against a rebellious Cyprus, Cimon proposed an expedition to fight the Persians. 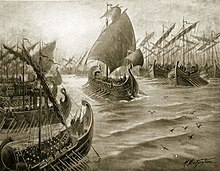 He gained Pericles' support and sailed to Cyprus with two hundred triremes of the Delian League. From there, he sent sixty ships under Admiral Charitimides to Egypt to help the Egyptian revolt of Inaros, in the Nile Delta. Cimon used the remaining ships to aid the uprising of the Cypriot Greek city-states. From his many military exploits and money gained through the Delian League, Cimon funded many construction projects throughout Athens. These projects were greatly needed in order to rebuild after the Achaemenid destruction of Athens. He ordered the expansion of the Acropolis and the walls around Athens, and the construction of public roads, public gardens, and many political buildings. ^ a b c DGRB&M (1867), p. 749. ^ EB (1911), p. 368. ^ a b DGRB&M (1867), p. 750. ^ a b Plutarch, Cimon 481. ^ a b Bury, J. B.; Meiggs, Russell (1956). A history of Greece to the death of Alexander the Great, 3rd edition. Oxford: Oxford University Press. p. 343. ^ a b c Thucydides, The History of the Peloponnesian War. ^ Herodotus, The History of Herodotus. ^ The Greek World: 479–323 BC, Simon Hornblower. Page 126. ^ Wycherley, R.E. (1992). "Rebuilding in Athens and Attica". Cambridge Histories. 5: 206–222. ^ EB (1911), p. 369.